Smart Energy Spray Foam offers System 17 PMA sales & installation on Long Island, and throughout New York City and Queens. System 17 PMA is a cost effective, water-based, polymer-modified asphalt waterproofing material with excellent elastomeric properties. It is engineered to meet or exceed the performance properties of the best polymer modified asphalt coatings. System 17 PMA is designed and recommended for use below grade on exterior foundation walls. This coating was developed for spray application. It provides a tough, durable finish which can bridge shrinkage cracks. System 17 PMA maintains its outstanding properties when exposed to chemicals commonly found in soils. System 17 PMA is manufactured to the highest quality standards and in accordance with ISO 9001 requirements. ISO certification ensures that every gallon manufactured meets the highest quality control standards in the industry and provides outstanding performance in the field. System 17 PMA is compatible with a wide range of drainage, protection and insulation boards. Your applicator can tailor the most cost effective solution to meet your needs. System 17 PMA's high solids and polymer content provide enhanced flexibility and leave additional waterproofing on foundation walls. 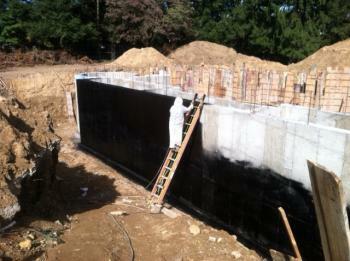 The advanced formulation allows the membrane to be sprayed applied to poured walls immediately after forms are removed. 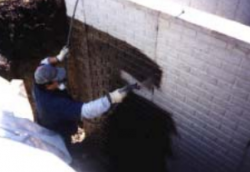 On block surfaces System 17 PMA can be applied as soon as the mortar is dry. System 17 PMA reduces total job time and minimizes application labor costs. Long term warranties are available on the System 17 PMA with terms from 10 to 20 years. Warranty terms vary according to the type and complexity of the waterproofing system installed. Repair and fill voids around tie holes, recessed ties and other small voids with a suitable, solvent-based asphalt mastic. After the wall and footing surfaces have been properly prepared, spray apply System 17 PMA over the exterior foundation walls and footings. Apply System 17 PMA at a rate of 20-25 sq.ft. per gallon. On unparged block surfaces, more material and/or additional application passes may be required to ensure a minimum 40 dry mil coating thickness. Do not apply System 17 PMA at temperatures below 20°F (-7°C).